"Break My Heart (You Really) / Heroine"
Sacred Heart is the debut studio album by the British pop-rock act Shakespear's Sister, released on 21 August 1989 by FFRR Records. The album was recorded after Siobhan Fahey decided to leave the girl group Bananarama. Initially intended as a solo act for Fahey, Shakespear's Sister became a partnership of Fahey and Marcella Detroit during the making of the album. The album spawned four singles, including "You're History", released in July 1989, which reached No. 7 on the UK singles chart and was the first release to present the act as a duo. The album peaked at No. 9 on the UK albums chart, and was certificated gold by the BPI. Although predominantly produced by Feldman, famed producer Jimmy Iovine (who was working with Fahey's husband's group Eurythmics at that time on their 1989 album We Too Are One) co-produced the track "You're History". The UK vinyl LP and cassette versions of the album did not feature the track "You Made Me Come to This", and the international LP version excluded both this track and "Twist the Knife". The album's title track was used in the 1990 film Nuns on the Run, and featured on the film's official soundtrack. The album was scheduled to be re-released as a 3-disc Deluxe Edition in 2014 through Siobhan Fahey's own record label, SF Records, however as of June 2016, its release appears to have been cancelled. A double A-side of "Break My Heart (You Really)" / "Heroine" was released in October 1988 as the album's lead single which, according to Fahey, was to "give a more rounded picture of what I'm about". In North American territories however, "Break My Heart (You Really)" was released as a standalone single, followed by "Heroine" in 1989. None of these releases charted in any territories. It was following this that Detroit officially became a member of the project and the second single, "You're History", was the first to feature Detroit in the music video. Released in July 1989, it became their first hit single, peaking at No. 7 on the UK Singles Chart. The single also achieved success internationally, reaching No. 12 in Ireland, and No. 20 in Australia. The third single, "Run Silent", peaked at No. 54 in the UK, and No. 47 in Australia. The fourth and final single from the album, "Dirty Mind", was completely re-recorded for its single release in February 1990, and peaked at No. 71 in the UK and No. 65 in Australia. 12. "Audio Commentary by Siobhan Fahey"
A video compilation, also entitled Sacred Heart, was released in 1989. It featured the four music videos that had been made so far ("Dirty Mind" had not yet been released). ^ "Review: Sacred Heart – Shakespear's Sister". Allmusic. Retrieved 28 July 2009. ^ a b c d "Official Charts > Shakespears Sister (singles)". The Official UK Charts Company. Archived from the original on 14 October 2015. Retrieved 14 October 2015. ^ a b "Official Charts > Shakespears Sister (albums)". The Official UK Charts Company. Archived from the original on 14 October 2015. Retrieved 14 October 2015. ^ a b "BPI Certified Awards > Shakespears Sister". British Phonographic Industry. Archived from the original on 14 October 2015. Retrieved 14 October 2015. ^ "Rish Charts > Shakespears Sister". irishcharts.de. Retrieved 16 December 2012. ^ a b "ARIA singles charts". australian-charts.com. Retrieved 5 January 2010. 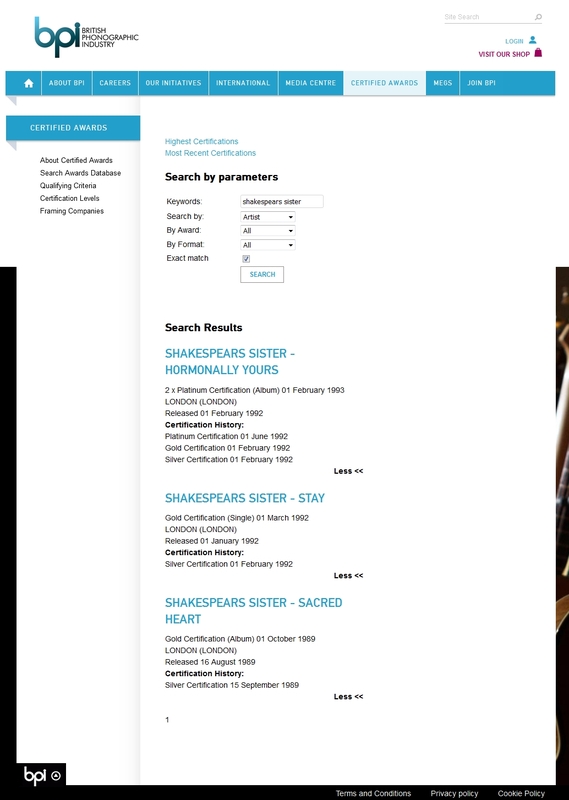 ^ "Australian Charts > Shakespears Sister – Sacred Heart". australian-charts.com. Retrieved 19 December 2012. ^ "GER Charts > Shakespear's Sister". charts.de. Retrieved 19 December 2012. ^ "Swedish Charts > Shakespears Sister – Sacred Heart". swedishcharts.com. Retrieved 19 December 2012. This page was last edited on 16 December 2018, at 17:09 (UTC).